WASHINGTON (AP) - President Donald Trump says he's now in favor of more legal immigration because of economic gains on his watch. 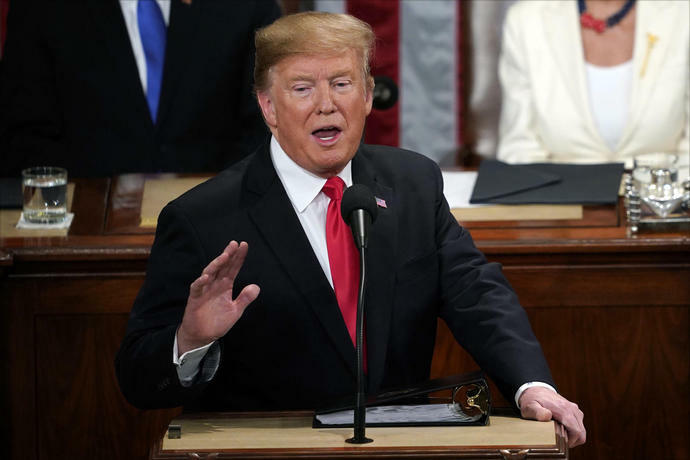 Trump raised eyebrows in his State of the Union speech Tuesday when he said he wanted people "to come into our country in the largest numbers ever, but they have to come in legally." His policy positions to date do not reflect that wish. That's according to a transcript tweeted by a reporter from The Advocate newspaper in which Trump is quoted saying: "I need more people coming in because we need people to run the factories and plants and companies that are moving back in." In his speech Tuesday, Trump had argued that immigrants in the U.S. illegally take jobs away from middle-class Americans. However, much of the recent economic research suggests that immigration has no significant effect on job growth for U.S.-born workers in the long-run. It's difficult to know just how many jobs will be added by newly planned mills. Construction spending on factories has yet to take off significantly after having been in decline between 2016 and much of 2018. Construction spending on factories has been flat in the past year, according to the Census Bureau. Trump has proposed several policies that would severely restrict legal immigration, including limiting immigrants' ability to sponsor family members to join them. He has also slashed for the last two years the number of refugees the U.S. will accept. The White House did not immediately respond to questions about how it might be translating Trump's new thinking into its policy stances and proposals.